When I started to build the kid wash, I printed the plans off in black & white, which if you look at the plans do not work if you cannot see the different colors that indicate the length of the cuts and the amount. It made it a bit more confusing then it needed to be. One of the problem that I had with the original design was the gate. For some reason I didn't understand the idea of how it worked, and when I did figure it out, I didn't like the way it worked. The second thing I didn't like was how unstable it was. 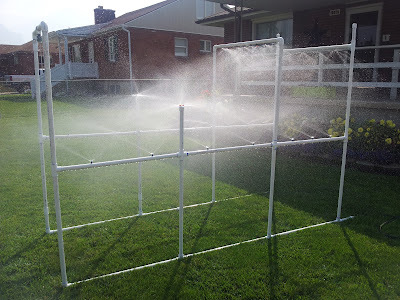 I was able to fix that with two extra cross joints and 2 more pieces of 2 1/2 ft. PVC pipe and lastly I wanted to spread the water out more (we need to make sure the kids get wet) by adding drip system sprayers instead of just holes. The extra cross pieces go between the first arch (where the gate would be) and the 2nd arch. You can see the difference in the below pictures, and the one at the top. * Cost based on prices at local hardware store. **As an update to this, I ended up removing the gate. It was always in the way and it really served no purpose. Fun Details (Optional): These are items are pretty much just for looks for when you are showing off your new cool kids car wash. The kids will pretty much destroy them shortly after they are installed. At the annual impromptu family Fourth of July party I setup the finished product for all of the kids to play in and let's just say we didn't hear from the kids for most of the day. I would call that a success. ** Update: I ended up gluing the side pieces together because the water pressure kept popping the joints apart. I didn't glue the top bars (that connect the sides) so I could still take it apart. I just lean it on the side of the garage during the winter. My kids played in the Kids Car wash all summer long, and it was a great way for them to beat the heat. The neighbor kids always loved to come over and use it as well. For the price I spent on building it I would say I got my money's worth. VERY NICE, WILL BE GETTING PARTS TONIGHT.. I DO LIKE THE SPRAYER EFFECT RATHER THAN JUST HOLES, BUT HOW DID YOU DO THAT, DRILL AND TAP OR DRILL AND GLUE.. waynerigley@gmail.com ( hangout ) or skype wwr2011 thanks ! I pre-drilled the holes and then used a socket wrench to screw in the sprayers. Could you please provide more detail about the mist nozzels? Where did you buy them from? Were they threaded? The more details you can provide the better. Thanks. You can get different degrees of spray depending on what you want to accomplish. 360, 180 and 90. Good luck, I hope this helped. Perfect, that helped a lot. Also I see your name as Xylene. My daughter's name starts with an Xy. Never thought I would see another name start Xy... Thanks again. Let me look around to see if I still have them. If not I can take some measurements off of mine.